How Easy Is It to Burn Through a 1TB Data Cap? We've already written about Comcast's push to saddle more of its customers with a broadband data caps—limits on the amount of data they can use each month without incurring additional charges. Possibly to make the caps more palatable, the company recently upped its data cap from 300 gigabytes (GB) to 1 terabyte (TB). That sounded like a lot of data, so we investigated how easy it would be to burn through a terabyte of data, and whether you'd be better off paying the extra $35 a month to get the unlimited data plan the company is offering. The truth is, while we're still not fans of data caps, we don't think that many families will have to worry about hitting a 1TB data cap any time soon. (See the math below.) But as more entertainment moves from traditional cable lines to the internet and 4K video becomes more commonplace, these data caps could eventually affect more of us. "The prospect of a U.S. household reaching 1TB of monthly use is still several years away," says Michael Greeson, co-founder and director of research at the Diffusion Group (TDG), a research and advisory group. "Even heavy Netflix households are lucky to hit 250GB to 300GB a month, so there is still a lot of headroom." Dan Rayburn, principal analyst at research firm Frost & Sullivan, agrees. "The reality is that very few households will ever hit a 1TB data cap, despite many saying that they don't like living with" such caps, he says. Okay, so you're not likely to hit 1 TB of data in a month, but that doesn't mean it's impossible. We asked Rayburn, who also runs the streamingmedia.com website, for a few scenarios in which a household would reach that level of data usage. We used video streaming for our calculations because it uses so much data—simpler tasks such as browsing web pages or posting Instagram photos don't even come close. According to Rayburn, the average Netflix video is 90 minutes long and eats up 1.6GB of data per hour (that's 2.4GB per 90-minute video). Netflix itself cites different numbers, estimating that standard-definition streams consume about 1GB per hour while high-def videos chew up 3GB per hour. We think Rayburn's number is more realistic, because even if you're ostensibly streaming HD video, the quality gets adjusted dynamically based on the available bandwidth at your home. We could do the calculation using any of these figures, and the results would be similar. Using Rayburn's number, in a single month you'd have to stream 416 Netflix videos of 90 minutes each to hit a 1TB data cap. Got four people in your family? You'd each need to watch 104 videos per month, or more than five hours of Netflix every day. That's well above one analyst's estimate of typical usage, which has Netflix subscribers spending two hours each day using the service. The above numbers cover a typical household outfitted with HDTVs. Those of us with 4K TVs could burn up far more data, however, so Rayburn helped us do another calculation. Streaming 4K content with high dynamic range can eat up 7GB to 10GB of data per hour. So, does that get us close to 1TB in a month? Not really. Even using the more aggressive estimate of 10GB per hour, you'd still need to watch 100 hours of 4K movies and TVs shows each month, or roughly 3.33 hours a day. You could watch every episode from all four seasons of "House of Cards"—52 hours in all—in 4K resolution in one month and barely crack the halfway mark of your data cap. Comcast calls 1TB "an enormous amount of data," adding that more than 99 percent of its customers do not come close to using that amount. The company estimates the median household usage is just 75GB per month. The company also notes that compression technologies such as HEVC still have room for improved efficiency. If so few households are likely to hit a 1TB data cap, then why are so many people opposed to it? "American consumers just don't like being told they can't do something," Rayburn believes. Of course, a downside to even a generous data cap is that while it might be sufficient for current usage, all evidence points to U.S. consumers using more broadband data every year. What seems like a huge amount of data now could feel restrictive a few years down the line. One reason broadband usage is accelerating is the proliferation of devices inside the home that all want access to the Internet. 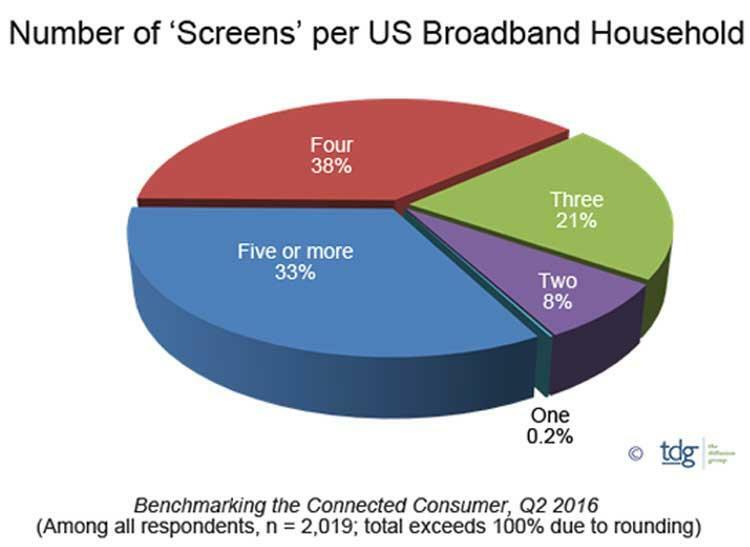 As shown in the chart below, TDG research found that one-third of all U.S. households now have five or more screens, and another 38 percent have four. All of those devices spend at least part of their time tapping into your broadband connection. Now even if you double the number of screens in a home, you don't necessarily double the amount of bandwidth they consume. The devices don't just include TVs, "but personal computers, tablets, and smartphones as well," TDG's Greeson says. "Keep in mind that non-TV screens are used primarily for data activities, not streaming video, which requires far less bandwidth than internet video." Greeson believes that homes will only start hitting 1TB-per-month broadband usage when they stream UHD TVs and embrace virtual reality headsets for gaming. Comcast has received a lot of attention for its data caps, but it's not alone. Additional internet service providers are either testing or imposing data limitations on their broadband customers. But not all providers are equally generous. CenturyLink and Suddenlink, now owned by Altice, have lower caps—ranging from 250GB to 600GB—that are tied to the speed of the customer's service. (Those paying for CenturyLink's gigabit service get unlimited data.) Most companies charge an extra $10 for each 50GB you use over the capped amount. Verizon, Cablevision (also owned by Altice), and Time Warner Cable (recently acquired by Charter) don't have caps. Charter, as a condition of its Time Warner Cable purchase, pledged not to impose caps for at least three years. Consumer Reports opposes data caps and usage-based pricing, especially now, when more people are looking to loosen the pay-TV stranglehold by turning to streaming entertainment options that can burn up a lot of data. We believe that even high data caps tend to discourage the use of broadband activities in homes that have them, and they often push people into paying an extra $30 or $35 each month for an unlimited plan out of fear they'll exceed the cap. And once established, data caps are likely to remain in place when more of us are regularly burning past what seem now to be generous limits. That day might not come this year or next, but it will probably be here eventually.